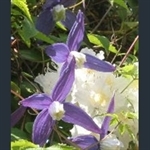 Most clematis are climbers, growing through shrubs and trees, or whatever support you want to give them. There are also a few herbaceous perennials, and at least one shrub. The colourful flowers are usually followed by the heads of feathery seeds, which are also ornamental. Herbaceous perennial with bell-shaped blue flowers. Non-clinging, herbaceous clematis with attractive pink bell-shaped flowers.